An Ethernet port (aka jack or socket) is an opening on computer network equipment that Ethernet cables plug into. Their purpose is to connect wired network hardware in an Ethernet LAN, metropolitan area network (MAN), or wide area network (WAN). You might see an Ethernet connection on the back of a computer or the back or side of a laptop. A router usually has several Ethernet ports to accommodate multiple wired devices on a network. The same is true for other network hardware like hubs and modems. An Ethernet port accepts a cable that has an RJ-45 connector. The alternative to using such a cable with an Ethernet port is Wi-Fi, which eliminates the need for both the cable and its port. Ethernet is pronounced with a long "e" like the word eat. Ethernet ports go by other names also, like LAN ports, Ethernet connections, Ethernet jacks, LAN sockets, and network ports. An Ethernet port is a little wider than a phone jack. Because of this shape, it's impossible to neatly fit an Ethernet cable into a phone jack, which makes it a little easier when you're plugging in cables. You can't really plug it into the wrong port. The picture at the top of this page shows what an Ethernet port looks like. It's a square with a couple rigid areas at the bottom. As you can also see in the picture, the yellow Ethernet cable is built the same way, usually with a clip at the bottom to hold the cable into the Ethernet port. Most desktop computers include one built-in Ethernet port for connecting the device to a wired network. A computer's built-in Ethernet port is connected to its internal Ethernet network adapter, called an Ethernet card, which is attached to the motherboard. Laptops usually have an Ethernet port, too, so that you can hook it up to a network that doesn't have wireless capabilities. A notable exception is the MacBook Air, which doesn't have an Ethernet port but does support connecting an Ethernet dongle to its USB port. If you have internet connectivity issues on your computer, the Ethernet port is probably the first place you should look because the cable might be unplugged. This condition often results in errors like 'A network cable is unplugged.' You might see such error messages especially if the computer or laptop was recently moved, which can easily knock the cable out of the Ethernet port or, in rare cases, unseat the Ethernet card from its place on the motherboard. Something else related to the Ethernet port is the network driver for the network card, which can become outdated, corrupt, or missing. One of the easiest ways to install a network driver is with a free driver updater tool. 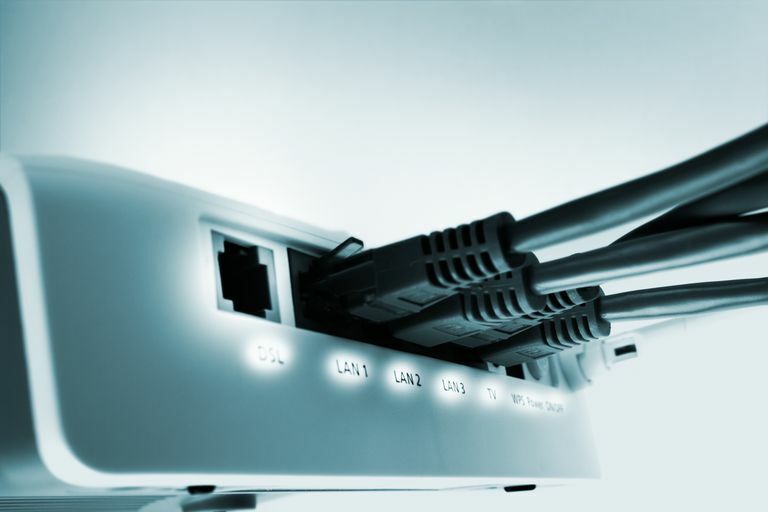 All popular broadband routers feature Ethernet ports, usually a few of them. With this setup, multiple wired computers in a network can reach the internet and the other connected devices on the network. An uplink port (also called WAN port) is a special Ethernet jack on routers that are used specifically for connecting to a broadband modem. Wireless routers include a WAN port and typically four additional Ethernet ports for wired connections. The image on this page also offers an example of how a router's Ethernet ports typically look. Many other types of consumer gadgets also include Ethernet ports for home networking, like video game consoles, digital video recorders, and even some newer televisions. Another example is Google's Chromecast, for which you can buy an Ethernet adapter so that you can use your Chromecast without Wi-Fi.